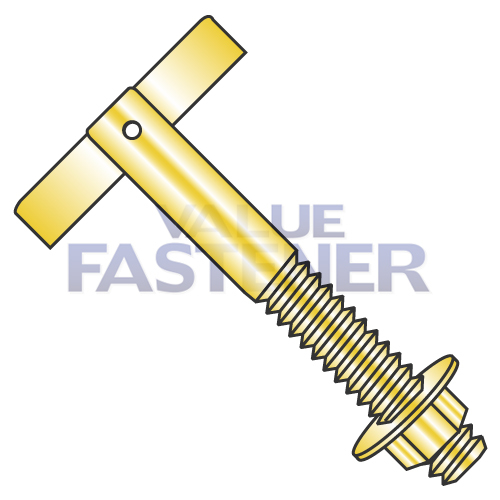 T-Anchors are a four-piece steel fastener consisting of (1) a partially threaded shank with a slit cut into the center of the unthreaded end; (2) a flat, rectangular stamped toggle that swivels on a pin that attaches it to the unthreaded end of the shank; (3) a hex nut; and (4) a circular flat washer. T-Anchors can be used in ceilings, hollow walls, steel, concrete or wood. T-Anchors require smaller holes than toggle bolts. Applications include overhead doors, light fixtures, shelf brackets and cable television units.